Drink Apple Cider Vinegar At Night To Stop Leg Cramps And Reduce Blood Pressure+ More! Last night, I made a big bowl of quick-pickled beets alongside some homemade falafels — so good! Whenever I’m aiming to quickly “pickle” cabbage, radishes or whatever else is on the menu, apple cider vinegar is always my right-hand man. If I were to tell you to drink a wee bit of apple cider vinegar at night, would you think I was going a bit overboard? If so, I can completely relate. I would have never shot back vinegar four to five years ago, but now it’s exciting knowing I can consciously make the choice to better my health. Here’s the exciting part — you can too! Research regarding the use of apple cider vinegar for positive health is well-documented. From weight loss to diabetes, this sour-tasting liquid is a natural remedy that should be included in everyone’s health regimen. More specifically, consume apple cider vinegar before bed each night. Not only will a “bedtime drink” encourage new, healthy habits, but it will also promote fullness. This is ideal for individuals who tend to snack at night. It promotes sustainable weight loss and optimal health. 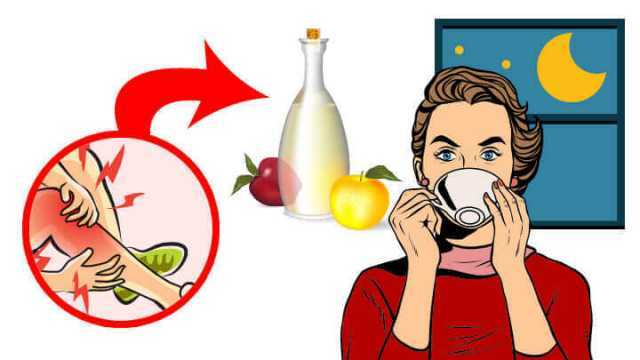 If you’re not convinced, here is how a daily intake of apple cider vinegar can benefit your health, starting today. Unfortunately, diabetes has continued to affect the lives of millions. In 2012, nearly 30 million Americans were living with diabetes‚ with more than eight million undiagnosed cases. Each year, the number of Americans diagnosed with this condition increases by 1.4 million — and this issue continues to grow. Based on its ability to lower post-meal and fasting glucose levels, this nightly regimen is highly recommended for those suffering from this disease. More importantly, consuming apple cider vinegar before bed can reduce next-morning fasting glucose levels. Within one key study, published in Diabetes Care, researchers focused on healthy adults, diabetics and pre-diabetics. They found that apple cider vinegar improved glucose readings across all three groups. After consuming less than an ounce, researchers observed noticeable effects after consuming a white bagel and orange juice, in comparison to when subjects consumed the same meal but drank a placebo. The individuals with pre-diabetes improved glucose levels by nearly 50 percent. Those with diabetes reduced their blood glucose concentration by 25 percent. With that being said, you do not need to be a diabetic to benefit from improved blood sugar levels. As you better control fluctuating blood glucose levels, you support a longer life span. Whether you’re going to bed with leg or menstrual cramps, apple cider vinegar can work a treat. For those who suffer from leg cramps, for instance, this can be caused by a number of factors. Perhaps it a nutrient deficiency, such as a lack of potassium — an essential mineral for muscle health. Potassium-rich apple cider vinegar can close this nutritional gap. It reduces one’s risk of developing muscle cramps, while alleviating the pain associated with pre-existing cramps. The same is true for those awful monthly menstrual cramps. An increased intake of calcium and potassium help relax the muscles within the uterus. We are currently facing an epidemic that is one of the key driving forces behind a large spectrum of diseases. With so many trendy diets and weight-loss fads, you need to ask yourself this: if these “solutions” truly worked, why are so many individuals still struggling with their weight? There is no better alternative than a healthy, balanced lifestyle — starting with your diet. When you actually make the choice to change what you put in your body, results will follow. In addition to more local, organic produce, nuts, seeds and probiotic-rich foods, apple cider vinegar can help you further your weight loss efforts. As mentioned above, this natural remedy helps regulate blood glucose levels. In turn, it will help control cravings and enhance satiety. Within one study, researchers studied the main component of vinegar — acetic acid. The researchers found that after consuming 15 or 30 milliliters of vinegar daily for 12 weeks, symptoms of metabolic syndrome improved. Overall, in comparison to the placebo group, both vinegar groups experienced a reduction in body weight. They also reduced body mass index, decreased both visceral fat and waist circumference and lowered levels of serum triglycerides. Researchers concluded that daily intake could reduce obesity and prevent metabolic complications. Nothing is worse than a sore, scratchy throat. Luckily, when you become ill, apple cider vinegar can come to your rescue. Far too often, as soon as symptoms surface, individuals rush to their local pharmacy for some good old fashion over-the-counter medication. More often than not, these drugs only mask symptoms, increasing your risk of adverse effects. Apple cider vinegar offers potent antibacterial properties, helping you target an irritated and inflamed throat. Not only will gargling with apple cider vinegar target problematic bacteria, but when consumed, this remedy can help restore an optimal pH in the body. The next time you have a sore throat, if you don’t want to drink vinegar, combine one to two tablespoons with water. Gargle this combination, helping to naturally disinfect your mouth and throat. If you’re going to take this route, gargling with warm salt water can also help. Which apple cider vinegar should I choose? Like any product on the market, there’s always an array of options — so which do you choose? Of course, the price tag often influences a buyer’s decision, but when it comes to something like apple cider vinegar, splurge for a higher-quality option. The first thing to look for is raw and organic. Next, pay attention to the bottle. Go for glass, since plastic packaging can leach into the vinegar itself. If you see something funky floating around on the bottom, that’s good! This is what’s called “the mother.” It is a direct result of fermentation. This is what offers key enzymes and live bacteria, supporting your gut health. In turn, it supports your overall well-being. On that note, make sure the vinegar is unpasteurized, which ensures that healthy bacteria survives. It’s a new year, so why not take this opportunity to truly improve your health? Baby steps quickly turn into leaps and bounds, trust me on that one. As you begin to incorporate new, healthy habits, they will become normal aspects of your everyday life. Starting tonight, dilute one tablespoon in a large glass of water. You can also incorporate it into your nighttime tea. Regardless how you approach this new regimen, get it down the hatch and start reaping the rewards! Hey Buddy!, I found this information for you: "Drink Apple Cider Vinegar At Night To Stop Leg Cramps, Lower Blood Sugar And More". Here is the website link: https://www.thealternativedaily.com/reasons-to-drink-apple-cider-vinegar-at-night/. Thank you.